I took it as a way to further show how her powers were like a copy of Sailor Moon's (even if her attacks were candy-themed) since she originally got them from being bathed in the light of the Silver Crystal's energy. So she's literally a copycat. They used her as a substitude for Chibiusa - a sign they never planned to go beyond Dark Kingdom. Yeah and the Sailor Luna stuff was stupid to me. For one if Luna becomes a human she should look like she did in the Sailor Moon S movie a young woman about a year younger then Usagi not a young kid. I personally would have rather they just made an original character to be the Sailor Chibi Moon of the show. 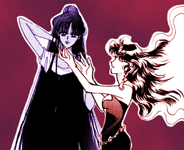 Maybe give one of the Inners a younger sister who could maybe be Senshi of one of the Moons of their planets well except Sailor Mars as her Moons are represented by her crows. The younger sister would have to be given to Jupiter then as Mercury and Venus don't have any moons. Actually in the manga Sailor Mercury and Sailor Venus were said to have two castles named Mariner and Magellan respectively. Now given that all of the other Senshi's castles were named after their Moons it is possible that in Sailor Moon that Sailor Mercury and Sailor Venus's castles were named after maybe hidden moons of their planets. So maybe Sailor Mercury could have a younger sister called Sailor Mariner or Sailor Venus have a younger sister name Sailor Magellan. So really either Sailor Mercury, Sailor Jupiter or Sailor Venus could have a little sister. Mariner and Magellan were satellites sent to investigate those planets not moons invented by Naoko. 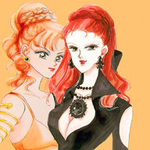 I am aware that they were named after artificial satellites but considering that all of the other Senshi's castles were named after Moons who is to say that Sailor Mercury and Sailor Venus couldn't have hidden phantom Moons called Mariner and Magellan. I mean there is a Nemesis in this Solar System on Sailor Moon that is the tenth planet and in the Sera Myu there is a planet called Vulcan. Objects that don't actually exist in reality so who is to say that Mariner and Magellan could not be hidden Moons of Mercury and Venus. A moon is itself a satellite. That's all there is to it. If Naoko had wanted there to be hidden moons for Mercury and Venus, she would have spelled that out since something like that would have been significant enough to warrant a mention. Again just because the Moons weren't mentioned dosen't mean they can't be there. Every other castle was named after a Moon so who is to say that Mercury or Venus couldn't have Moons of their respective castles names. Again just because the Moons weren't mentioned dosen't mean they can't be there. We know they're not there because Naoko based the story's planets Mercury and Venus on the real ones. If she had intended to make up fictitious moons for the fictional versions of the real planets she would have done so, in a clear and obvious manner that would mean we wouldn't even be having this discussion right now. Every other castle was named after a Moon so who is to say that Mercury or Venus couldn't have Moons of their respective castles names. Correction: Every castle was named after a satellite, be they natural or artificial. Those that lacked natural ones had their names applied from artificial ones. That's all. We know they're not there because Naoko based the story's planets on the real ones. If she had intended to make up fictitious moons for the fictional versions of the real planets she would have done so. Correction: Every castle was named after a satellite, be they natural or artificial. Those that lacked natural ones had their named applied from artificial ones. That's all. That is not true she added numerous planets that didn't exist like Nemesis for instance or extra solar planets like Kinmoku or the Animamate's planets. Plus we also have Vulcan in the Sera Myu and Sailor Astarte also seems to be the Senshi of some hidden Moon maybe the Moon of Vulcan as both are said to be on the opposite side of the Sun. So again if she added fictional planets there is nothing saying that Mercury or Venus couldn't have hidden satellites especially since every other castle is named after a real Moon of the planet in question. That is not true she added numerous planets that didn't exist like Nemesis for instance or extra solar planets like Kinmoku or the Animamate's planets. Plus we also have Vulcan in the Sera Myu and Sailor Astarte also seems to be the Senshi of some hidden Moon maybe the Moon of Vulcan as both are said to be on the opposite side of the Sun. I was talking about planets Mercury and Venus. So again if she added fictional planets there is nothing saying that Mercury or Venus couldn't have hidden satellites especially since every other castle is named after a real Moon of the planet in question. You've just further proved my point in that we know about those made up fictional planets from having been told about them by the series since such information was vital enough for us to be told about them in the first place, whereas no such information has ever been given about made up moons being made for planets Mercury and Venus while instead we know that their castles were named after known real world artificial satellites in lieu of the real world planets Mercury and Venus having any natural satellites of their own. Let's not forget that, in the Codename: Sailor V manga, we see the planet Venus and Venus's castle, and there are no moons in sight. If Naoko had intended Venus's castle to be named after a moon, she had an opportunity in that scene to show said moon. Since she didn't, it's reasonable to infer that was not her intention. Again with all of the hidden celestial objects that Sailor Moon it is very possible that Mercury and Venus could have Moons I mean Nemesis isn't visible to Earth very much in Sailor Moon neither is Vulcan. Also maybe the Moons could have been destroyed. In the manga atleast and I think in the 90s anime as well Sailor Senshi remain Senshi of their planets even if their planet is destroyed like Kinmoku. Besides interestingly enough this scientific article speculates that Mars may have originally had three moons but the third one got destroyed. I have always been confused about that. Every Sailor Senshi is her planet princess, but all of them were living on the moon. When the Moon was destroyed they were all reincarnated on Earth. But what happened to their respectful kingdoms? If they were not destroyed and still exist, wouldn't they need their heirs to rule on them? Were they as advanced as the Moon Kingdom? This plot has always seemed to me not flesh out and even a bit random. For three story arcs we are told Usagi is THE princess, the special one and suddenly they are all princesses themselves.Even in the future they are still in Crystal Tokyo, so what. Is going on with their kingdoms? For me it feels random like the convenient pairing with the generals. Who knows maybe the Dark Kingdom sent separate armies to attack the other planets. I mean Phantom Ace aka Adonis said that he was recruited to join Endymion's army in the war I think so maybe there were attacks on the other planets that were not explored. No their castles were intact however it seemed like there were no other survivors and no kingdoms on their planets. Well, while they all certainly spent a lot of time on the moon, Venus at least also spent a lot of time on her home planet which was definitely inhabited, as seen in the Sailor V manga. (Though weirdly, as Maria sort of mentioned, though Venus is one of the sworn guardians of the Moon Princess, her armies side with Earth's in the war between Earth and the Moon Kingdom, which seems like a bizarre conflict of interest?) So presumably, the other girls' planets were also inhabited. (Though not the same continuity/canon as the manga of course, the novelization of the La Reconquista musical also states that their planets are inhabited and each has its own unique culture/civilization.) And since we see Magellan Castle in the first chapter of the Sailor V manga (which was originally published in the May 1993 issue of RUNRUN), the idea that all the Sailors were princesses was obviously something in Naoko's head long before the Dream arc. The fact she had this in her head doesn't make it less silly considering all the plot holes it opens.